With Toy Soul 2017 done for another year, little Dino got a little update at Toy Soul! We got some close-up shots of the updated prototype for you all. Some say the little Dino went to visit Willy Wonkers chocolate factory and fell into Molton chocolate, and some other rumours say he overloaded himself with chocolate hence the cocoa colour. 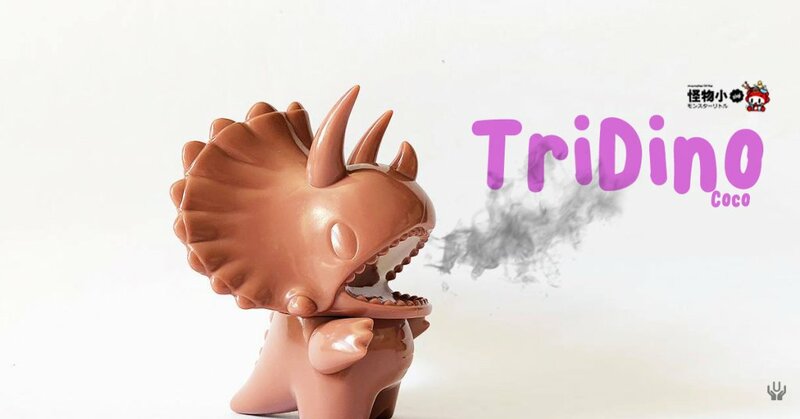 Whatever the rumours maybe, Ziqi Monster Little x Unbox Industries updated the all-new “TriDino” that Dino lovers have been waiting for since making its prototype debut at TTF 2017. At this early stage, it looks like another winner and possibly one of the cutest Triceratops EVER. the battle for the cuteness is ON! Which colours would you like to see on TriDino? Comment in the comment section below. No news when the ETA will be for TriDino, but knowing how fast Unbox move it should be early 2018!